This was an awesome breakfast-for-dinner meal: French toast, Japanese style. We used our favourite yumbly multi-grain bread, which was coated with a mixture assembled from four eggs, 200 milliliters of soy milk, and a tiny bit of brown sugar sauce. We used the latter instead of syrup. Yusuke described it as a homemade mitsu sauce: 100 milliliters of water, 100 grams of brown sugar, and 100 grams of superfine sugar, simmered together in a pot until sticky. In addition to the mitsu, we topped the French toast with fabulous anko and a dusting of kinako (soybean flour). But don’t worry if you think we actually consumed a non-healthy meal. In addition to the French toast, we also ate a nice thick soup with tomatoes, cabbage, carrots, onions, and bean sprouts. We thus covered the key food groups: fruits (i.e., tomatoes), veggies, grains, and anko. Anpan, a soft, chewy bun filled with sweet bean paste, is one of the most wonderful Japanese foods to which I have been exposed. To quote Yusuke, his mouth full of the tasty pastry: “It’s so sad that Canadians don’t know about anpan.” My picture doesn’t really show it well, but an image search yields more examples. For those interested in etymology, the an refers to anko, which is the red bean paste, and pan is borrowed from the Romance language root for bread (e.g., French pain). I can’t really compare it to anything that’s common in North America; you’ll just have to taste it for yourself. As Yusuke says, “it’s sooooooo good.” Especially when it’s fresh out of the oven from Yuki’s Bakery. Yuki’s is a fabulous boulangerie/pâtisserie in our neighbourhood owned by a Japanese ex-pat and her husband. They have exquisite European-style truffles, tarts, and cookies—often with a Japanese twist, all types of bread and pastries, and a few deli items like cheeses, sandwiches, and quiche. And most importantly, anpan. They only make it on Saturday mornings, so I often stop in to buy a treat for Yusuke, but I have to get there early before it’s all gone. The owner always knows that I’m there for anpan! Yuki’s also sells their wares at the local Japanese festivals, and at the August matsuri we sampled their green tea cheese cake and of course, anpan. Anpan is so popular in Japan that there is a very famous (think Bugs Bunny) kids’ cartoon character called Anpanman. Anpanman is a super-hero whose head, naturally, is Anpan. One of his special powers is an an-punch. He has a huge cast of food-themed friends, including Onigiri-man (rice-ball man), Currypan-man (curry bread man), and his dog Cheese. I love the pictures of all the characters on this Japanese site (click on the image of Cheese the dog). Anpanman’s nemesis is Baikinman (Germ Man). Scary! We took the opportunity to pose with a cardboard Anpanman at the festival in August. Quiche is one the staple “things-I-can-make-successfully” in my repertoire. This one came out a little odd, but still tastier than I expected. (The oddness was due to the fact that I under-filled the pie with the eggs and milk, rather than over-filling like I usually do.) 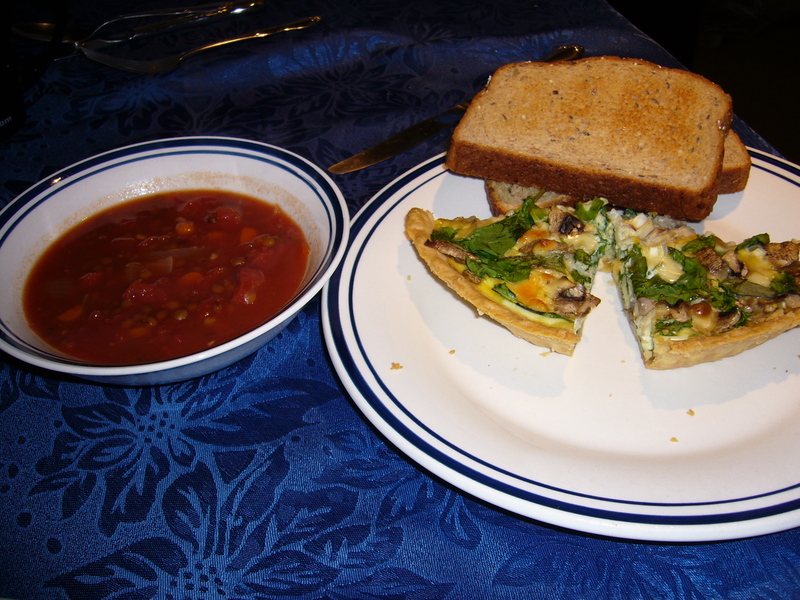 The vegetables were baby spinach, mushrooms, and green onions. 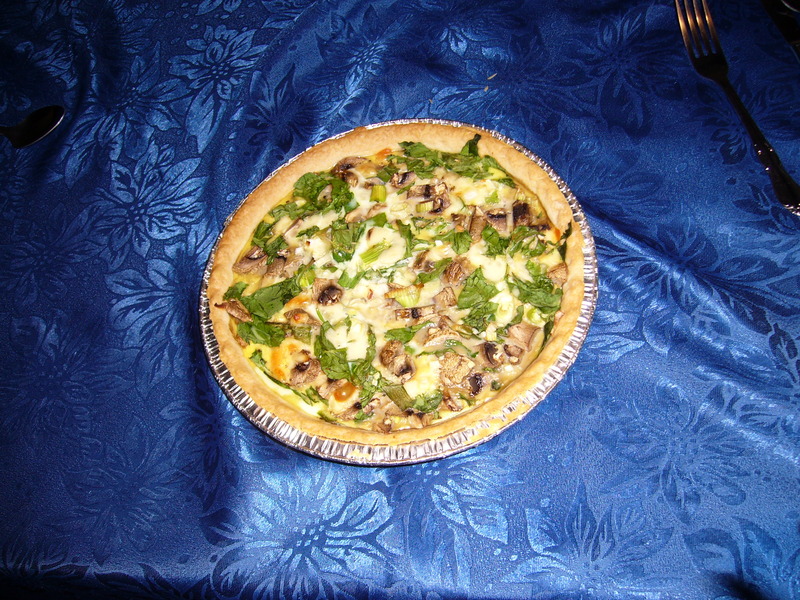 I used soy milk instead of regular milk, which gives the quiche a sweeter taste. I used mozzarella cheese, which again has a milder taste than Swiss (which I use sometimes). I seasoned the egg mixture with black pepper, salt, a tiny bit of mixed Italian herbs, and a pinch of nutmeg. All-in-all, it wasn’t bad, but not nearly as good as Mom’s quiche. The lentil soup was also nearly instant, as I used a can of diced tomatoes. First, I cooked white onions in a bit of rice liquor, then I added the tomatoes, chopped carrots, lentils, a couple bay leaves, and salt and pepper. Before eating it, we added a splash of red wine vinegar to each bowl, per Jen’s suggestion. 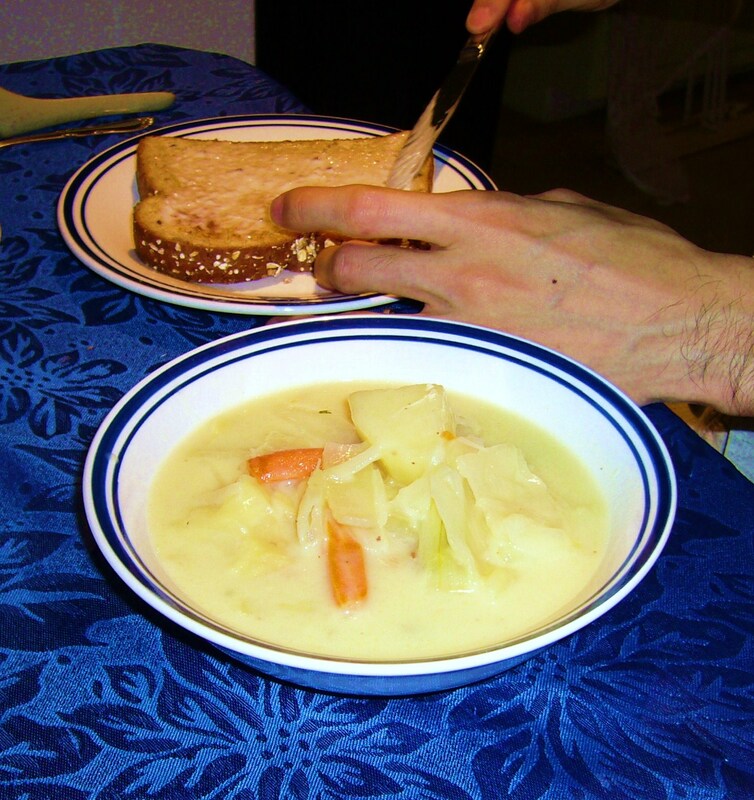 This creamy white stew features carrots, cabbage, potatoes, and white onions. (And chicken, which, as usual, I didn’t eat…picky, picky.) The base of the stew is very simple: just flour, milk, butter, white wine, and salt and pepper. I was surprised when Yusuke said that’s all that was in it, since the flavour is very rich. It’s filling enough that we only had some toast on the side to complete the meal. In my mind, it’s sort of a quintessential Northern/Eastern European dish, but food like this is also very popular in Japan. In fact, you can buy pre-made sauce cubes that just dissolve in boiling water. So efficient.